Also check out our Single Degree tracks in Cairo and Stuttgart. 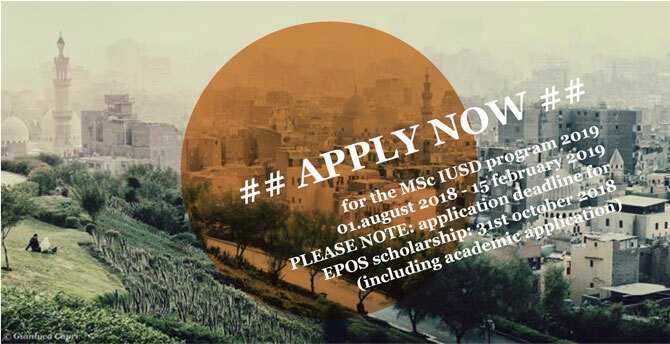 The Integrated Urbanism and Sustainable Design is a Masters’ program hosted at the University of Stuttgart and Ain Shams University in Cairo. It trains and prepares a new generation of urban practitioners to face the tremendous environmental, cultural, socio-economic and governance challenges resulting from the dynamic urban transformation around the globe. It is open to graduates and young professionals from the fields of architecture, urban planning, landscape architecture and regional planning as well as to graduates with other Bachelor degrees and with relevant professional experience. Our philosophy is based on transnational learning exchange between students with different regional backgrounds applied to a specific urban reality. Our joint IUSD Lab´s experiential learning hubs are based in Egypt (IUSD Lab Cairo) and Germany (IUSD Lab Stuttgart) and embedded into a network of international partner institutions and universities around the world. Teaching at both universities is based on interdisciplinary teamwork and on site-specific projects in cooperation with local communities and with different stakeholders, organizations and institutions, locally and internationally. IUSD students acquire reflective and practical skills to develop integrated and transdisciplinary solutions for planning, managing and designing landscapes, cities and buildings. The IUSD program has been jointly developed and established since 2011 by the two partner universities University of Stuttgart and Ain Shams University, Cairo. The double-degree program with the first year in Stuttgart University and the second year at Ain Shams University in Cairo serves as its backbone and is supported by the German Academic Exchange Service (DAAD) through the program “Development-Related Postgraduate Courses”. The double-degree program is supported by a high-profile advisory board and by various German, Egyptian and international organizations, including UNHabitat, GIZ (Deutsche Gesellschaft für Internationale Zusammenarbeit GmbH), and CEDARE (Centre for Environment and Development for the Arab Region and Europe). These partnerships offer IUSD students numerous opportunities to test and develop skills in challenging and complex applied contexts. Starting in 2016, both universities also offer the IUSD as a single degree program in both locations, with different study and exchange opportunities. This year our Department of International Urbanism at University of Stuttgart is going to host the 19th N-AERUS conference from November 8-10, 2018. Here to get further information. The SI and IUSD are glad to welcome Michael Krause talking about "Violence Prevention Through Urban Upgrading in Cape Town, South Africa“. The SI and IUSD are glad to welcome Kurt Ackermann talking about "Growing food, growing community: Good Hope Farm and the new opportunities for urban agriculture in Cape Town, South Africa“. The ILPÖ and IUSD are glad to welcome Danielle Hoppe talking about "Building Sustainable Mobility: Perspectives from Latin American Cities". The SI and IUSD are glad to welcome Daniela Zupan talking about "Innovations in urban planning and design: the compact mixed-use city model". The SI and IUSD are glad to welcome Michel Samaha talking about "The Surviving of the Lebanese Old Cities: History and Challenges - The case of Tripoli". The SI and IUSD are glad to welcome Dr. Harry Smith talking about "Increasing Urban Resilience: Towards co-management of landslide risk in low-income settlements in Medellin, Colombia." The IUSD Alumni Symposium organization team is glad to announce our 2017 IUSD Alumni Symposium in Stuttgart. It will be the first occasion for graduates, team members, friends and network members to come together and jointly engage in a uniquely designed symposium format. The symposium consists of three intensive days, supported by a professional team of moderators. From day 1 all participants are invited to actively participate in the sessions. Moreover, side events complement the exchange. Location: Hospitalhof, Büchsenstr. 33, 70174 Stuttgart. The IZKT, the City of Stuttgart along with the IUSD Alumni Symposium organization team is glad to invite you to our keynote speech by Prof. Dr. Dr. h.c. mult. Klaus Töpfer, former German Minister for the Environment, former Executive Director of the United Nations Environment UNEP. The MSc. IUSD Program, as part of the GAMP network, participated in a Thinking Lab at the Workshop on the Role of Higher Education, Science and New Alliances - 2030 Agenda. The workshop took place in Berlin. "New Paradigms in international Urbanism"
The Institute of Urban Planning and Design at the University of Stuttgart kindly invites to the lecture of Prof. Dr. Astrid Ley (Chair of International Urbanism), followed by a reception. Victoria will share her PhD research results within the frame of IUSD's Guest Lectures. Prof. Dr. Philipp Misselwitz will share his preparatory research and consultancy work for Habitat III within the frame of the IUSD's Core Module UPPSUM. IUSD Stuttgart is happy to welcome Dr. Alexander Jachnow (USP, IHS Rotterdam, Erasmus University) to speak about "Post Governance Cities: Validating Urban Values" within the IUSD Lecture Series. IUSD Stuttgart, in collaboration with e1nszue1ns platform is happy to welcome Dr. Anupama Kundoo (Barcelona) to speak about "Building Knowledge: Empowering people while building affordable space" within the IUSD Lecture Series. IUSD Stuttgart is happy to welcome Dr. Kirsten Hackenbroch (University of Freiburg) to speak about "Report from the ‚Formality / Informality: Insights from negotiating access to urban space in South Asia" within the IUSD Lecture Series. The IUSD team Cairo and Stuttgart joined the annual strategic network meeting of GAMP. Representatives of the MSc. IUSD management and teaching team met for its first of several strategic workshops on IUSD's future. Stuttgarter’s IUSD’s Intake VI went to Venice 3 - 6 November 2016 to join the Biennale. IUSD Stuttgart is honoured to welcome three guests to the IUSD Lecture Series. to speak about their work in practice and academia. IUSD Stuttgart is honoured to welcome Hilmar von Lojewski (Deutscher Städtetag) to speak about "Report from the ‚Global Front‘ - HABITAT III Conference Quito and its impacts for Sustainable Urban Design" within the IUSD Lecture Series. IUSD is happy to start the next academic year with the sixth IUSD intake. This time, 19 young professionals have started their joint IUSD experience in Germany, and 5 young professionals have started their joint IUSD experience in Egypt. 21 September 2016, Msc. IUSD graduates, Dina Mahdy (IUSD Intake III) and Franziska Laue (IUSD Intake I) discussed on „Social Innovation as a Derivative of Scarcity of Resources: Cases from “Rural” and “Urban” Areas in Egypt. The session was held in DAAD premises in Cairo, and was moderated by Prof. Dr. Mohamed Salheen. This 19-22 September 2016 students from IUSD Intake IV successfully defended their master theses and joined a cheerful celebration. IUSD participating at HuP competition … and winning! IUSD is very proud to announce, that IUSD not only has got six finalists out of 19 in this year’s HuP competition, but also that two of them, Salma and Manuel, won the competition and were awarded an internship with the GIZ. IUSD Lab Stuttgart is having a workshop in June to discuss some of the challenges related to destruction of urban World Heritage in conflicted areas. The thematic conference and workshop “Strategies for Post-War Reconstruction” gathers young and experienced researchers and practitioners from Syria, Italy and Germany. IUSD is happy to announce the upcoming IUSD Lecture by Morrocan architect and urban designer Yassine Moustanjidi. The IUSD Lab's next event will be an expert and young researchers' workshop on "Strategies for Reconstruction for Aleppo". The event will welcome colleagues and researchers from Stuttgart, Cottbus, Berlin, Bari, Budapest, Beirut, etc. The IUSD team ast Ain Shams Univertsity and Stuttgart University welcomes our new international MSc. IUSD Intake. We are looking forward to the upcoming winter term 2016/2017. IUSD is glad to share the lastest documentary videos from IUSD Lab's symposium "Let's walk urban landscapes" can now be viewed online. Our application portal has closed 15 February 2016. We thank all applicants for their timely submission. We are now in the reviewing process. All applicants will be notified via email in the coming weeks. IUSD Stuttgart was honoured to welcome Grace Stead (ICLEI Africa) to speak about "Low Emission Development Implementation in South Africa" within the IUSD Lecture Series. IUSD is honoured to welcome Dr. Holger Kuhle (GIZ/UNSDSN) to speak about "The Sustainable Development Goal for Cities Within the 2030 Agenda - How to Get Operational?" within the IUSD Lecture Series. IUSD is honoured to welcome Prof. Dr. Peter Herrle (former chair of Habitat Unit at TU Berlin) to speak about "Housing for the Urban Poor: From Local Actions to Global Networks" within the Core Module "Urban Policies, Planning and Sustainable Urban Management" (UPPSUM). The event will be complemented with the launch of the publication of the same title. We are happy to have received Klaus Teschner (Misereor and Trialog e.V.) within the frame of the IUSD program and the SI's design project "Borderzone |Grenzraum - Welcome to Tijuana". Mr. Teschner was talking about "Transformation of people's settlements", referring to experiences in Latin America and Africa. IUSD team members from Cairo and Stuttgart, as well as students and alumni gathered in Dortmund on the occasion of the N-AERUS conference titled "Who Wins and Who Loses? - Exploring and learning from transformation and actors in the cities of the South" at TU Dortmund. Contributions to the conference were given, among other, by Ahmed Osama Bakri (IUSD Alumni from Intake III) and Dr. Josefine Fokdal. IUSD Lab Cairo presented one of its research projects in Cairo. The IUSD Stuttgart team was honoured to have received Prof. Dr. Mohamed Salheen to speak about "Towards Integrated Planning: An Approach to Sustainable Development" within the frame of our UPPSUM I lecture series. IUSD at Professional Fair "Engagement Weltweit"
IUSD Cairo and IUSD Stuttgart team along with the GAMP network members joined the professional fair "Engagement Weltweit" in Bonn. In the winter term 2015/16, the International Masters Program IUSD is inviting international lecturers to present their practical and academic work on differing cultural, professional, educational values. The lectures will take place within the core modules of IUSD and will be open to an interested audience. Looking forward to see you around. The Integrated Urbanism and Sustainable Design Masters Programme (IUSD) celebrated the graduation of the third cohort on Thursday, the 17th of September, 2015. The IUSD is a double-degree Masters Programme between Ain Shams University in Egypt and Stuttgart University in Germany. The ceremony witnessed the graduation of 17 students from several countries (Egypt, Germany, Jordan, Lebanon, Syria, and Tunisia). IUSD is happy to start the next academic year with the fifth IUSD intake. This time, 21 young professionals from eleven countries worldwide (including Egypt, Syria, Tunisia, Palestine, Sudan, Dominican Republic, USA, Estonia, Taiwan, Honduras and Germany) have started their joint IUSD experience in Germany.
" PROCESS TYPOLOGY AS A TOOL FOR URBAN AND LANDSCAPE DESIGN"
During the summer term 2015 , the International Master Program IUSD invited Prof.Dr. Annalinda Neglia to present her pratical and academic work on cultural heritage sites redevelopments. We proudly announce our latest IUSD PR movie that has been uploaded to our YouTube channel. Enjoy! In this year’s summer term 2015, IUSD students took again part in the competition "Zwischen Hörsaal und Projekt" (between lecture hall and project), initiated by the GIZ. The task was to design a poster critically assessing one selected ongoing international project by GIZ. This included direct communication and mutual exchange with staff in the respective projects. On June IUSD students joined an introductory workshop on “Capacity Works - The Management Model for Sustainable Development”, offered by GIZ in Eschborn to the GAMP Masters' Programs. The IUSD Team from Stuttgart and Cairo will participate at the huge event "Kirchentag 2015". At the "Markt der Möglichkeiten" (Market of Opportunities) we will be present with a booth from 04.-06.06.2015, from 10:30h - 18:30h directly next to the BMZ, one of our funding partners. We would be glad to see you there, have a chat and inform you more about the IUSD programm! Once again, the fourth intake of young professionals studying at IUSD joined the other four German Arab Masters Program (GAMP) students from Marburg/Beirut, Cologne/Amman, Kassel/Cairo, and Ludwigsburg/Cairo during the Berlin Module this May. IUSD INTAKE IV goes to the Earth Construction Workshop " Festival Grains D'ISERE"
The IUSD Students of our current fourth intake are taking part at the 14th Festival "Grains d'Isère in Villefontaine, France by the organizations CraTerre and amaco. The students will learn during the workshop the practical experience about the processes in the field of sustainable architecture by using their own hands. They will get the opportunity to learn different mud brick constructions, rammed earth, adobe, plastering and earthen architecture in general. We are proud we take part already for the fourth time. The IUSD Team would like to thank all applicants for their interesting applications for the upcoming IUSD Intake of the year 2015/2016. The selection process is now finished. As we received the highest amount of applications since the start of the program, it was a difficult task to find the right students which would fit the best for the IUSD program. We are looking forward to start the 5th Intake with students from more than 15 different countries in September 2015. The semester will start on the 01.09.2015 with the Introduction Weeks and exciting excursions, symposia and more. The lecture will be held within the frame of the English lecture series “Urban Policy, Planning and Sustainable Urban Management I” (UPPSUM I). The IUSD students of the fourth intake were participating actively at the GIZ Hochschultag at the German headquarter of the GIZ in Eschborn with students from international Master programs in the field of development. The GIZ introduced itself as potential employer and gave examples of it's work in the Urban Fields all over the world. After the presentations, the students were joining several group discussions around the topic of urban development. In the winter term 2014/15, the International Masters Program IUSD is inviting international lecturers to present their practical and academic work on differing cultural, professional, educational values. The lectures will take place within the core modules of IUSD and will be open to an interested audience. Looking forward to see you around. From rich and famous to landscaping for the poor. We just updated our Youtube Channel „MSc IUSD“ with the latest IUSD lecture by Ahmed Dorghamy. Please click Here to watch the lecture. The quality of IUSD MSc. program is successfully tested in an accreditation process. Click on News to get more information. IUSD is happy to welcome Ahmed Dorghamy on 21st October for an IUSD lecture on "Sustainable Mobility and Paratransit in Greater Cairo" in Labor 8 at 5.00 p.m. The event will be videoconferences to Cairo. We are happy to announce the new publication of the Yearbook 2013/2014. Please click on News to see the "Yearbook 2013/2014"
We wish you a pleasent reading. The Graduation Ceremony of IUSD's 2nd Intake took place, on Thursday 15th of September. Click on News to get some impressions. Following the common tradition between Ain Shams University and Stuttgart University, the IUSD team in Cairo organized an interesting program for the students of the third IUSD intake who are starting their second year in Cairo. We just updated our Youtube Channel „IUSDmsc“ with the latest IUSD Monday lectures. Please click here - or simply use the YouTube symbol on the left side - to get some impressions. "Uncharted Territories - Landschaftsarchitektur in fremder Umgebung" at the Leibniz University Hannover. The panel debate will be held in German. The event takes place at the Leibniz University Hannover. As the IUSD Master students of Intake IV are arriving in Stuttgart, we would like to say a warm-hearted WELCOME! We are very happy to have you here and are also excited to start our introduction weeks with many joint actions and enriching experiences. We already would like to announce the official welcoming event with professors and staff, which will take place on the 9th of september from 6 to 7 p.m. in the room "Labor 8" (K1, 8th floor). Open for Bachelor and Master students of Architecture & Urban Planning, University of Stuttgart. IUSD Video conferencing hall – 1 El Sarayat street- Abdo Pasha square, Faculty of Engineering, Architecture Building – Ground floor, Cairo. Graduates from the first intake 2011 will talk about where they came from study, work experience, why they decided to join IUSD and where it took them. The event takes place within the Jahresfest 2014, of the Faculty of Architecture and Urban Planning, University of Stuttgart. Our next and final Monday Lecture ML05 by Michel Samaha, will deal with the challenges in planning in the context of rehabilitation ofhistiric city centres in Lebanon - the case of Saida. Michel will join us via skype. For our friends outside of Stuttgart, we will provide the video via our youtube channel soon. We gladly announce our next IUSD Monday Lecture taking place in Stuttgart next Monday, 07 July at 2.00 p.m. in room 8.06, aka Labor 8. This time Bernd Hörmann will be talking about his "Experiences in the field of environment, sustainable development and climate change in the UK - from NGO to local government". We gladly announce our next IUSD Monday Lecture taking place in Stuttgart next Monday, 16 June at 2.00 p.m. in room 8.06, aka Labor 8. Berlin based architect and planner Thomas Stellmach from Uberbau will present „reality bites“ taken from his work experience in different cultural contexts – from Iraq to Russia. "The Production of Recovery Space: Architecture and Reconstruction Challenges". The students of IUSD Intake III have the pleasure to invite Prof. Camillo Boano (UCL) for a lecture in Stuttgart (as part of the Monday Lecture Series), this Tuesday. He will give his lecture within the frame of the seminar "War Destruction & Reconstruction". The third intake of the IUSD program joined the other German-Arab Master Program Students (GAMP) in Berlin last week for the so called "Berlin Module". The new AGEP homepage is online and IUSD is part of it! Click on news to get further information. We gladly announce our next IUSD Monday Lecture taking place in Stuttgart next Monday, 28 April at 2.00 p.m. in room 8.06 (transferred to Cairo via VC). IUSD is happy to announce its first IUSD Salon, organized by the colleagues from IUSD Ain Shams. From 6.00 to 9.00 p.m., experts and practitioners will discuss around the subject of "Water Sensitive Landscape Design". It will take place on 7 April in the premises of Ain Shams University (IUSD VC room) and transferred via videoconferencing into IUSD Stuttgart's Labor 8. We are looking forward to a lively discussion among all our expert guests and interested listeners. The IUSD students of the third intake were participating actively at the GIZ Hochschultag at the German headquarter of the GIZ in Eschborn with students from international Master programs in the field of development. The GIZ introduced itself as potential employer and gave examples of it's work in the Urban Fields all over the world. After the presentations, the students were joining several group discussions around the topic of urban development. We are still in the middle of the selection process and will probably announce the results in the first two weeks of April! IUSD IV attending a workshop on the occasion of the Africa Days of the BMBF in Berlin. We welcome Lisa Deister for an interesting guest lecture. The new GAMP (German-Arab Master's Programmes) website is launched! We just updated our Publications sections with the IUSD Yearbooks, different Guides, the Wagenhallen Atlas and more! Please take a look to get a better impression of the IUSD program. We are very inspired and excited about the lively contributions to the Live Project Workshop at the University of Stuttgart with guest from all over the world by the IUSD Lab. The application period for the upcoming fourth MSc IUSD intake (winter term 2014/2015) now officially started! The application deadline will be 31st january 2014. If you have questions regarding your application or the application portal, please take a look at our application portal manual. Click here to get to the application portal. The Application Portal Manual will guide you through the application process. The application period will start soon! The online application portal will formally open on 15th december 2013 and close on 31st january 2013. We welcome Julia Hartmann (former IUSD student) for an interesting guest lecture. Best greetings from our second intake IUSD students from Tunis! The IUSD team from the Ain Shams University and the students of the second intake are temporarily based in Tunis for a short study period. They are supported by former IUSD students Zaineb Madyouni, Insaf Boh and our external expert Lara Paris and hosted by the Ibn Khaldoun University, Tunis. We welcome Isabel Concheiro (ETH Zürich) for an interesting guest lecture. Our new IUSD Students of the third intake had the possibility to attend the TOPOS Conference with lectures of Mohamed Salheen, Antje Stokman and Yasar Adanali from the IUSD programme. We would like to welcome our new students to Stuttgart, we are happy to have you here! We are looking forward to many new and enriching experiences together. We are happy to announce the new publication of the Learn Move Play Ground - Summerschool! Moritz Bellers from the IUSD contributed as landscape architecture to this Workshop which had the goal to improve two courtyards of public schools in the informal areas of Cairo. It was a wonderful process and ceremony! On April 11th, 2013 We welcome Crisitian Suau Director of ECOFABRICA (www.ecofab.org) who is holding a Ph.D. in Architecture as well as a Master in Urban Design for an interesting guest lecture. International Spring School at Siwa Oasis, Egypt - Application Deadline for German students extended! Geman students who are interested in this year's MSc IUSD Spring School at Siwa Oasis in Egypt can still apply. The deadline was extended until 08. April 2013. Apply now for the International Spring School at Siwa Oasis, Egypt! The Spring School will take place from 25. April till 05. May 2013. The international and interdisciplinary student spring school, proposed by the IUSD Lab Stuttgart/Cairo will take place in Siwa, Egypt. The desert oasis of Siwa is still a remote and very traditional place in Egypt but under development pressure from its people, an incoming tourism and investments. The task of the workshop is to help the Siwan people, which are looking for a new modern expression for their houses by keeping their traditional identity. We are completely overwhelmed by this year’s amount of applications. The diversity of nationalities and different professional backgrounds is fascinating and we are amazed how many people take interest in our MSc IUSD programe. Now we are looking forward to an exciting selection and intake process. All applicants will be informed by E-mail about the results and further steps. The new application period started. The international symposium Integrated Urbansim II: On Resilience will take place in from 30 September to 1 October 2012 in Cairo. Registration is open now. A preliminary programme will be published here soon. MSc IUSD in one of the academic partner in Stuttgart for the upcoming 72 Hour Urban Action in Stuttgart. The Students will help to map and identify users, needs, sites and missions, as well as create orientation packs and for visiting international participants of the competition. The world's 1st real-time architecture competition will be the kick-off of a series of major urban interventions. All around the site of the largest urban redevelopment in Europe - Stuttgart 21 - the center of a 30 year heated public debate. Please click here to view an updated version of the Wagenhallen Atlas, the first joint product of the MSc IUSD students in this year's Research and Design Module. Students of the MSc IUSD organised a one day workshop with speakers and participants of the international Symposium Integrated Urbanism Dialogues.